The search for a beginner’s sewing machine | Sew Lindsay, Sew! Some months ago, I was surfing the incredibly addicting craft site Etsy.com. I started looking at a purse made with some cute, Japanese Peter Pan fabric, but wasn’t quite sure I wanted to pay $35+ for one that wasn’t exactly what I wanted. I suddenly thought, “If only I could get the fabric myself, I bet I could make a better one.” I’m not really sure why that thought popped into my head, as I had tried to learn some basic sewing machine skills from my mom in junior high and was an admittedly lazy student with crooked stitches and impatient knots and tangles. But I couldn’t get the thought out of my head as I started browsing sewing blogs and pattern review sites. The wheels in my brain started cranking full-speed, imagining all of the purses, clothes, accessories, home goods, and gifts I could create if only I had the proper tools, determination and maybe some professional instruction, but I still wasn’t sure that my instantaneous ambition justified the purchase of a sewing machine and related supplies for a few hundred dollars (all of the sudden, that $35+ for the Peter Pan purse didn’t seem so bad). I let the idea stew for about a month. When I still couldn’t stop looking at patterns and concocting ideas, I started researching sewing machines. In my research, I realized that sewing machines are a lot like cheese soup recipes: everybody has a really differing opinion about what’s the best, and a person’s level of satisfaction really depends on their background and what they are seeking. 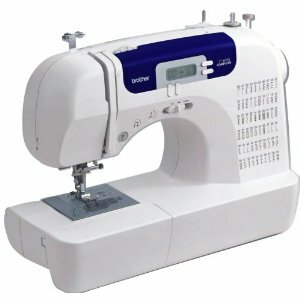 I also realized that there are a lot of lousy sewing machines out there, and while buying a brand new machine can be expensive, it’s extremely common to get a lemon when buying used. I decided that a brand-new machine would be my safest option, so I did a lot of research to find the most economical beginner’s machine available. I ended up with the Brother CS6000i for around $160, as it had a 4.5 out of 5 rating on Amazon.com, compiled from about 400 reviews. Now, I have only been using my Brother CS6000i for a few months, but I have really come to adore my little economical machine. It came with a handful of helpful accessories, perfect for a beginner. The computerized functions are definitely a step above the older machine I tried to learn with in junior high, although a tiny part of me worries that when there’s a computer malfunction, the whole machine will be shot. I try not to think about that. Overall, I am incredibly satisfied with my first sewing machine purchase and really proud of the pieces this little beauty has helped me stitch together. How do you go about justifying and researching major purchases? I am so excited about your blog! One day I hope to buy a sewing machine as well, as I have been up to some projects but am doing them all hand-sewn…which takes ages and doesn’t look as professional, of course!! Thanks Krissy! Your successful public blog(s) over the past few years are definitely a part of what inspired me to start my own! I know a lady who does that fancy rouching? or gathering? on baby doll dresses…you’d like her…playdate?? We should definitely get together and sew! My October has been jam-packed craziness, but maybe sometime in November/ December? We can hold a few sweatshop events and try to create economical gifts for our fam and friends! Oh and I’d love to learn rouching/gathering/whatever other talents your friend has to offer and is willing to teach! Pingback: A monster of a project | Sew Lindsay, Sew!